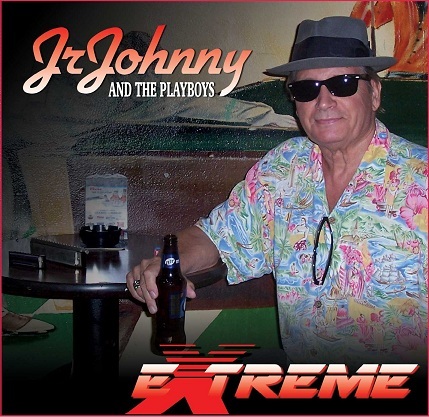 Jr. Johnny’s EXTREME CD’s are now available! Mark Korpi – Lead Guitar, Slide Guitar Mark has played with Gary Primich, Brewer Phillips, and his own band Space Coast Playboys, and many more. Stephen Minnich – Rhythm Guitar Stephen has played with the Mixed Generation, Jim Coyle Band, Sun Mountain Fiddler, and many more. Bill Singletary – Bass Bill has played with Luther Tucker, Pine Top Perkins, the Dynatones, and many more. Walter Shufflesworth – Drums Walter has played with Big Walter Horton, Johnny Littlejohn, Charlie Musselwhite, Elvin Bishop, Lowell Fulson, as well as his own band The Dynatones, and so many others! Kenny B3 Clarke – Organ Kenny has played with Steve Thorpe Blues Orchestra, Big Bill Morganfield, Lowell Fulson, and many more. This new album clearly and undoubtedly shows Jr. Johnny has just recorded his best album up to date. This is an honest record that brings us Johnny’s great harmonica playing. He is backed by the Playboys who provide the necessary resources to enhance this kind of blues based on old school traditional Chicago blues, and make them sound warm and really appetizing. The musicians are Mark Korpi on lead and slide guitar, Steve Minnich on rhythm guitar, Bill Singletary on bass, Walter Shufflesworth on drums and Kenny Clarke on the Hammond B-3. With these twelve original tracks we can breathe and feel the real spirit of the blues that could be heard during the sixties in old Chicago clubs like Theresa’s or The Pepper’s Lounge, just to mention a couple of the most prestigious ones of that time, because the magical power of imagination has no limits if you are willing to let it fly. As usual in Johnny’s music, you can breathe that distinctive Lou Reed’s scent. He gets thanks to his great vocals. Which becomes a unique very special stamp of this really great original musician. GREAT!!! The cd you sent me (Extreme) is on constant repeat at home, in my car and in the office! The great singing and songwriting. The musicianship, production and attitude really adds weight to the already great feel. The recordings are really “in your face” in the most positive meaning. It’s great to hear a cd where the songs, the performances and overall feeling creates “a picture” for the listener. Your cd is being played in: Holland-Scandinavia-BeNeLux-France-Germany-Italy and the U.K. This “Extreme” is already the fourteenth album Jr. Johnny. The man is an excellent harmonica player and songwriter ditto. His voice on this release makes me think of Lou Reed repeatedly. He declaims case more than he knows how to impress. Really vovcaal In the style of his songs there is absolutely nothing wrong with that. The songs are soulful and call. Tinted blue The blues harp will play a leading role, sometimes sensitive than lashing back fairly boisterous. The rocks are soft from beginning to end. There is not really a song that stands out. It is more variation on the same theme. But in this genre, this is all quite good. Do not expect dramatic lash out, or quiet country, brooding songs like the cited Reed who used to put down. The final “Greenwich Village Nights” is the best calling card that this release could imagine (see video). The man’s characteristic voice, supporting tools and rather beautiful bluesharp game. This song is something to your liking then you will really taste the plate. Jr.Johnny’s new cd. “Extreme” rocks from beginning to end! It’s the best $15:00 investment I ever made! Great rocking blues band and vocals sounding like Lou Reed! Love your new cd. “Extreme”. Great band and awesome song writing! Your vocals sounds like Lou Reed. Love the hit song “Greenwich Village Nights”. The whole cd. is “Extreme”! Johnny you’re the greatest cromatic harmonica player I ever heard! I like all of your “Extreme” cd. especially “Highway Melodies” and “She”. Your YouTube video “Greenwich Village Nights”; Great job! I listened to your new cd. “Extreme” tonight. Sounds great! “Greenwich Village Nights” is a great song and YouTube video too! Your new you tube video “Greenwich Village Nights” is a very cool song! Junior Johnny’s new cd. is a hoot. He’s very creative, twelve great original songs, great musicians and lots of fun. Junior’s new cd. is a rocking extravaganza! Junior’s new cd. is “EXTREME”! Love your new hit song and you tube video “Greenwich Village Nights”!